Couple, Wayne and Jeannie Sykes, traveled from North Carolina to compete in the Luray Sprint Triathlon. Both have been runners since the 70’s and Jeannie has been doing triathlons since 1981, before there was even any established order in the sport of Triathlon. They enjoy coming to Luray for the Triathlon and then making a weekend of it, enjoying all the other activities, adventure, and beauty the area has to offer as well. 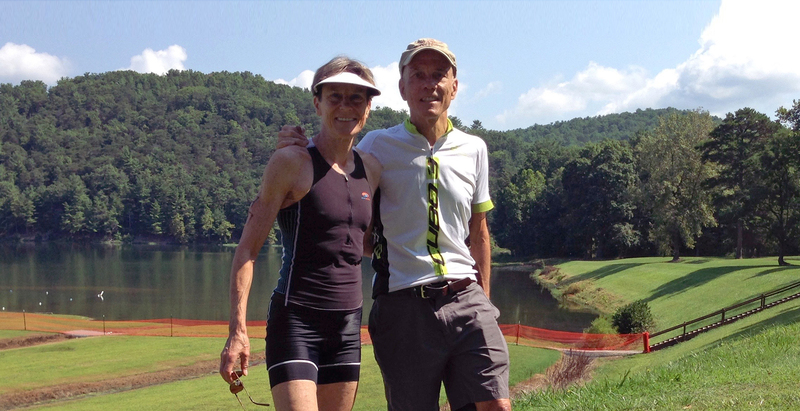 We caught up with Jeannie and asked her a few questions about herself and Wayne and their experience with the Luray Triathlon. Wayne was born and raised in Miami, FL, but has lived in Greensboro, NC since 1982. He is retired from his CPA firm. Current hobbies include competitive bridge, including online bridge with his 97-YO mother; bike, swim, and run training; and walking our Basset Hound without fail. I (Jeannie) was born in VT, but lived in MN and Ontario, Canada before NC. I work 3 days a week as a registered dietitian, and my main hobby, besides swimming, cycling, and CrossFit, is learning Danish. How far did you travel for the Luray Triathlon? We drove from Greensboro, NC, 4(+) hours. What made you travel to do the Luray Triathlon? We did the race in 2011, and had had a great experience then. We LOVE the beautiful Shenandoah Valley, and really like the Luray venue. How long have you been doing triathlons, how did you get started? My very first triathlon was in 1981 in Jacksonville, FL, which was before there was any established order; we ran, then biked, then swam! Wayne has a long swimming history (age group swimmer through collegiate swimmer at U of AL), and I was a very mediocre swimmer at the U of VT. We both competed in running after college, in the 1970’s. We started cycling in 2009, and have been competing in triathlons together since 2010. How did you get started doing the Luray Triathlon? Wayne found it online, and it sounded like a great race, so we decided to make a weekend out of it. Each time we’ve come, we have stayed at Piney Hill B&B, which has added to the quality of our whole experience. We have found some fun stuff to do the afternoon of the triathlon, stay over that night, then enjoy a scenic ride in the country Monday morning before heading home to Greensboro. What do you think about the Luray Triathlon? I told someone just yesterday that it’s probably the best race we’ve participated in. It has all the elements: excellent organization; friendly, competent volunteers; spectacularly beautiful venue; great prizes; and all within range of lots of additional enjoyable activities. What sort of training did you do before the race? Our summer training schedule includes 3-4 swims, 3 rides, and 3 run/walk workouts per week. We each also do minimal (but consistent) strength training – Wayne does weights at the gym 2 times a week, and Jeannie, CrossFit 1-2 times a week. An underlying motivation for all of our training is to go into our old age as strong and as fit as we can be. Triathlons are a fun way to challenge ourselves in the process (not to mention good justification for that fine craft beer after a race). We had such a great time, and enjoyed not just the race itself, but meeting some of the other athletes, visiting Hawksbill Brewery, driving through part of the Shenandoah National Park, and visiting the Rescue Zoo in Luray. After another delightful ride on the day after the race, we were lucky enough to enjoy breakfast on the back porch of our B&B, overlooking tranquil pastures and the mountains beyond. It doesn’t get better than that! Did you set and reach any goals with the Luray Triathlon? Well, yes, it’s always nice to make the podium. What was your favorite thing about the Luray Triathlon? The superb organization of it, and great t-shirts this year, magnificent venue, and good competition. What competition is next for you after Luray Triathlon? That was the end of our tri season; next month we are off to visit our daughter, who lives in Denmark, bringing bikes, of course! Wayne will be joining our daughter and son-in-law in a half-marathon in Copenhagen. Any advice you have for someone considering doing the Luray Triathlon. PLAN TO STAY AT LEAST ONE EXTRA DAY, IF YOU CAN. There is plenty to do, and excellent riding while you are there. 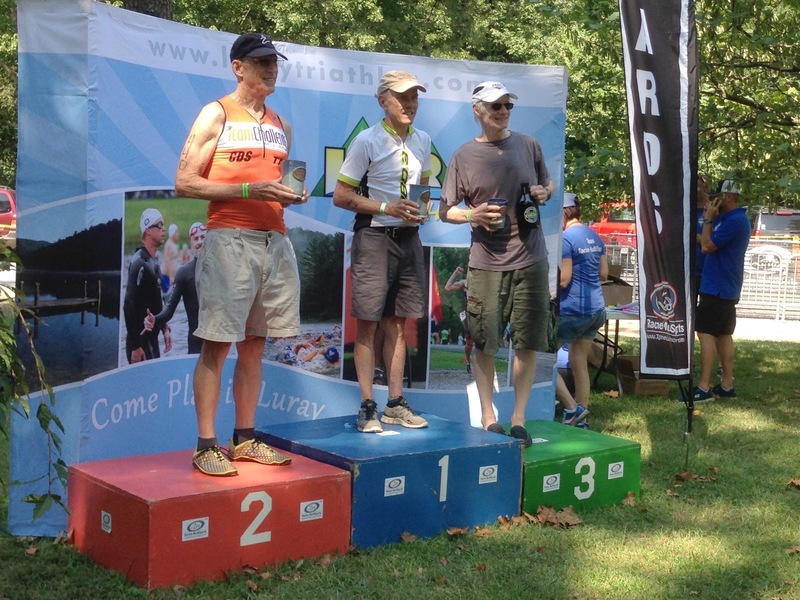 Wayne on the podium getting his award – 1st Place Age Group 65-69.